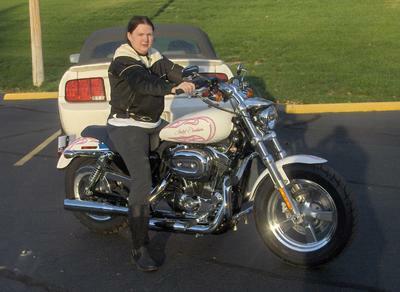 I bought my bike saturday I rode it the first time on saturday,let me tell you I was scared the first time it was the 1st bike I was on after taking a Riders edge course.My bike is a 1200 sportster custom.Just rode it in a church parking lot.Took the bike Out for the sencond time Tuesday evening again to a bigger church lot rode about two hours.Learned how to go up and down hills,and learning how to make my turns better.Taking it a little slow don't want to rush it,learning out to ride the back brake 2 lol.Just having a blast with it looking forward to rideing down the street for the frist time. How are you now :) I have only been on my bike a few times and heading to MSC next week.....Hope I get the skillz I need down :) Congrats and lovely bike. A new Sportie rider here! I bought a sportster 72 2 months ago, have ridden about 30 miles total in parking lots and now through our very small town. Took the msf course 3 wknds ago (didn't rde it until after I took the course). The "72" just came out in 2012 ( looks like a bobber/chopper type bike) it is intimidating after being on a little 125 kaw. for my class.... I'm getting less scared as the days go by. I have the hardest time in the driveway trying to turn around, or get in the garage (it's uphill and bumpy). Have decided to focus on turning in tight places in a parking lot about a mile away. (i get road practice as well as close-quarters practice all in one trip)... Keep us posted on how you're doing. I LOVE your bike it's got a killer paint job! I LOVE IT !!!!! I passed the MSF class in May, got my license in June and took my time all summer long!!! I started in an abandoned parking lot by the house, graduated to the street and the church parking lot, then on to industrial streets on the weekends when the business' were closed...on to busy streets, then to work & back 35 miles, a 70 mile ride, a 185mile ride....ALL IN BABY STEPS!!!! It took me all summer to accomplish these things and I was just fine with that!!! I would only take another step when I WAS READY!!! Kudos to you !!!! You will be riding around the neighborhood soon enuff when you are ready!!!! I absolutely love riding and I hope that you will enjoy it just as much!!! Keep the shiny side up sister, good luck & stay safe!!!! My first bike is a Sporty 1200 Custom also! Glad to know I wasn't the only new rider with a big bike! Just be really careful cuz they have a lot of power. Lots of parking lot practice before getting out on the road. Have fun, enjoy the experience and be careful! Take your time and enjoy it! Sometimes all I want to do is ride around my neighborhood, working on turns, shifting, etc. etc. Congrats and keep practicing. Riding is a wonderful experience. Love the colors of your bike.